Uncoordinated movement is due to a muscle control problem that causes an inability to coordinate movements. It leads to a jerky, unsteady, to-and-fro motion of the middle of the body (trunk) and an unsteady gait (walking style). It can also affect the limbs. The medical name of this condition is ataxia. Smooth graceful movement requires a balance between different muscle groups. A part of the brain called the cerebellum manages this balance. Diseases that damage the cerebellum, spinal cord, or peripheral nerves can interfere with normal muscle movement. The result is large, jerky, uncoordinated movements. Encephalitis is irritation and swelling (inflammation) of the brain, most often due to infections. Friedreich ataxia is a rare disease passed down through families (inherited). It affects the muscles and heart. Multiple sclerosis (MS) is an autoimmune disease that affects the brain and spinal cord (central nervous system). A home safety evaluation by a physical therapist may be helpful. Take measures to make it easier and safer to move around at home. For example, get rid of clutter, leave wide walkways, and remove throw rugs or other objects that might cause slipping or falling. People with this condition should be encouraged to take part in normal activities. Family members need to be patient with a person who has poor coordination. Take time to show the person ways to do tasks more easily. Take advantage of the person's strengths while avoiding his or her weaknesses. Ask the health care provider whether walking aids, such as a cane or walker, would be helpful. In an emergency, you will first be stabilized so that symptoms do not get worse. A detailed examination of the nervous system and muscles, paying careful attention to walking, balance, and coordination of pointing with fingers and toes. Asking you to stand up with your feet together and the eyes closed. This is called the Romberg test. If you lose your balance, this is a sign that your sense of position has been lost. In this case, the test is considered positive. When did the symptoms begin? Does the uncoordinated movement happen all the time or does it come and go? Have you been exposed to something that may have caused poisoning? What other symptoms do you have? For example: weakness or paralysis, numbness, tingling, or loss of sensation, confusion or disorientation, seizures. Muscle function loss is when a muscle does not work or move normally. The medical term for complete loss of muscle function is paralysis. You may need to be referred to a specialist for diagnosis and treatment. If a specific problem is causing the ataxia, the problem will be treated. For example, if a medicine is causing coordination problems, the medicine may be changed or stopped. Other causes may not be treatable. The provider can tell you more. Lang AE. Other movement disorders. In: Goldman L, Schafer AI, eds. Goldman-Cecil Medicine. 25th ed. Philadelphia, PA: Elsevier Saunders; 2016:chap 410. Subramony SH, Xia G. Disorders of the cerebellum, including the degenerative ataxias. In: Daroff RB, Jankovic J, Mazziotta JC, Pomeroy SL, eds. Bradley's Neurology in Clinical Practice. 7th ed. Philadelphia, PA: Elsevier; 2016:chap 97. 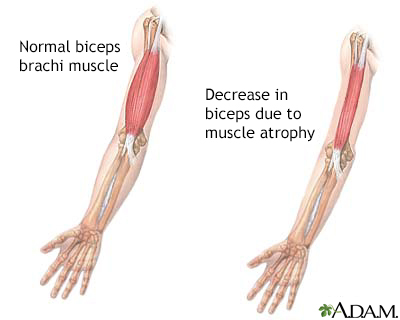 Muscular atrophy is the decrease in size and wasting of muscle tissue. Muscles that lose their nerve supply can atrophy and simply waste away. Reviewed By: Amit M. Shelat, DO, FACP, Attending Neurologist and Assistant Professor of Clinical Neurology, SUNY Stony Brook, School of Medicine, Stony Brook, NY. Review provided by VeriMed Healthcare Network. Also reviewed by David Zieve, MD, MHA, Medical Director, Brenda Conaway, Editorial Director, and the A.D.A.M. Editorial team.